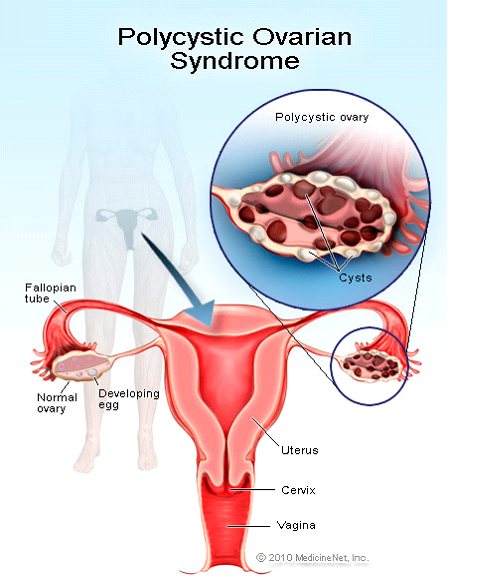 Polycystic ovarian syndrome (PCOS, polycystic ovary syndrome) is a relatively common hormonal disorder that causes a number of different symptoms in women of reproductive age. Common to all women with PCOS is an irregularity in the menstrual cycle and the presence of excess male hormones (androgens). The condition was named because of the finding of enlarged ovaries containing multiple small cysts (polycystic ovaries). Although most women with PCOS have polycystic ovaries, some affected women do not. PCOS has also been referred to as Stein-Levinthal syndrome and polycystic ovarian disease (POD). The exact cause of polycystic ovarian syndrome is not clear, although a number of abnormalities have been documented in women with PCOS. There is some evidence for an inherited (genetic) cause for PCOS, although no specific genetic mutation has been identified as the cause. It has been shown that the ovaries of women with PCOS may produce excessive amounts of male hormones, or androgens, which lead to disruptions in the menstrual cycle and impaired fertility. PCOS is also associated with insulin resistance, or an impaired ability to utilize insulin, and this abnormality is also likely related to the cause of PCOS. The presence of small cysts in the ovaries is not specific for PCOS, since women who do not have PCOS may have ovarian cysts. Therefore the presence of cysts is not likely to be the cause of the symptoms of PCOS. PCOS leads to disruptions in the menstrual cycle that typically begin around the onset of puberty . Menstrual cycles may be normal at first and then become irregular, or the onset of menses may be delayed. The menstrual irregularities of PCOS are accompanied by a lack of ovulation, so affected women may experience infertility . The desire for pregnancy is a factor that prompts many women with PCOS to first seek medical attention. Because of the absence or reduction in ovulation, women with PCOS have reduced levels of the hormone progesterone (normally produced after ovulation in the second half of the menstrual cycle). This can result in growth stimulation of the endometrium (lining tissues of the uterus), leading to dysfunctional uterine bleeding and breakthrough bleeding. Increased stimulation of the endometrium in the absence of progesterone production is a risk factor for the development of endometrial hyperplasia and uterine cancer. Insulin resistance, weight gain, and obesity are also common in PCOS. Observers have suggested that about one-half of women with PCOS are overweight or obese. Insulin resistance, accompanied by elevated blood levels of insulin, occurs in most women with PCOS, independent of the presence of obesity. Women with PCOS have also been reported to have an increased risk of developing type 2 diabetes , and many studies have shown abnormal blood lipid levels and elevated levels of C-reactive protein (CRP), a predictor of coronary artery disease. The combination of type 2 diabetes, elevated cholesterol and LDL levels, and elevated CRP levels suggest an increased risk of coronary heart disease on women with PCOS, although this risk has not yet been scientifically established. It is appropriate to seek the advice of your health care practitioner if you have irregular or absent menstrual periods, abnormal or excessive hair growth, difficulty in getting pregnant, or any of the other troubling symptoms of PCOS. While the diagnosis of PCOS may be suggested by the characteristic symptoms, a number of laboratory tests can help establish the diagnosis and rule out other conditions that may be responsible for your symptoms. Blood tests may be performed to evaluate levels of male hormones, such as DHEA and testosterone, as well as gonadotropins (hormones made in the brain that control production of hormones in the ovaries). Levels of hormones produced by the thyroid and adrenal glands may also be evaluated in order to exclude other causes of the symptoms. Although the finding of cysts (small, fluid-filled sacs) in the ovaries is not conclusive for PCOS, many affected women will have polycystic ovaries. It is important to note that the presence of cysts in the ovaries is a common finding in women without PCOS as well. Imaging studies such as pelvic ultrasound can be safely used to demonstrate the presence of cysts in the ovaries. Ultrasound uses sound waves to generate an image of the ovaries; the procedure involves no radiation exposure or injected dyes and carries no risks for the patient. There are a number of treatments that have been shown to be effective in the treatment of PCOS. Treatment is dependent upon the stage of the woman's life and may be directed toward establishing regular menstrual cycles, controlling abnormal uterine bleeding, controlling excess hair growth, management of associated conditions such as insulin resistance, or promoting the chances of pregnancy when desired. •	elevated blood cholesterol and LDL ("bad" cholesterol) levels. As with any chronic condition, maintenance of a healthy lifestyle can help maximize quality of life and minimize symptoms. Proper nutrition and regular exercise can help manage the weight gain and elevated blood pressure that may accompany PCOS. Weight loss has also been shown in many studies to reduce some of the effects of excess testosterone in women with PCOS. Medications are the mainstay of treatment for both the menstrual and hormonal symptoms of PCOS as well as associated medical conditions. Oral contraceptive pills are used in some women with PCOS to establish a regular menstrual cycle and to reduce the risk of endometrial hyperplasia and cancer by establishing regular menstrual periods. A medication called clomiphene (Clomid) can be used to induce ovulation (cause egg production) in women who desire to become pregnant. If this treatment is not successful, women with PCOS and infertility may require other, more aggressive, treatments for infertility such as injection of gonadotropin hormones and assisted reproductive technologies. Metformin (Glucophage) is a medication used to treat type 2 diabetes. This drug affects the action of insulin and is often used to treat women with PCOS. A laparoscopic procedure known as ovarian drilling of the ovaries, in which portions of the ovary are destroyed, has also been used to reduce androgen levels and treat PCOS in some women. It is important for women with PCOS to routinely follow-up with their health care practitioner according to his or her recommendations, both for the management of the hormonal effects of PCOS as well as the treatment of associated conditions. Since the cause of PCOS is poorly understood, it is not possible to prevent PCOS. However, maintenance of a healthy weight and lifestyle are important in preventing and controlling many of the conditions that may be associated with PCOS. Hormonal therapies to induce a regular menstrual cycle and to help prevent the risk of endometrial cancer are usually successful, as are medications that reduce androgen actions. The prognosis is variable among women with PCOS who undergo fertility treatments. In women who are overweight or obese, ovulation can sometimes be achieved by moderate weight loss alone. Others may need medications or assisted reproductive technologies to conceive. Although the outlook for infertility treatments varies according to the woman's age and other medical conditions, studies show in general that about 80% of women with PCOS ovulate in response to oral clomiphene citrate (Clomid), and approximately 50% get pregnant. Assisted reproductive technologies can be successful for some women who do not conceive.